Office communicator changed in-office commnicatoions. It's easy,effective and economical. My status is great feature. It provides little more information about the present status of a colleague whom you wanted to call. You know his status even before the call - Available,Busy,Do Not disturb,In a meeting etc...etc. which is missing in a normal intercom or Phone! However, there may be issues associated with this "My Status". Other day, a doctor friend of mine gave a frantic long distance call to to learn a trick to appear online for a considerable time even if he is away. Here is the Trick .Infact its not a Trick... Its one of the Options given by communicator to appear "Online" atleast for 1 Hour of system idle time. 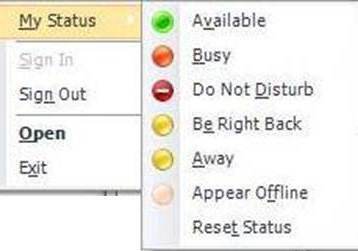 If you wish to appear offline, You can select Offline status from the menu.